Through this process, I found that my "and" logic for the trigger seemed to be sending two triggers on each note gate. In other words, if I turn off all but one of the switches, I'd get two triggers, one at the step with the switch on, and one at the next step. I figured that the AND of the clock and the gate were overlapping at the end as well as the start.... but when I looked at the trigger out on my scope, there was no actual trigger pulse that I could see on the trailing edge. Then as I started turning the scope (a pocket DSO Quad) on and off, that also would effect the running. Sometimes turning it off would kill the trigger entirely. Later, it would simply cause the pulse to get stuck and no amount of banging around would make it go again until I turned the scope back on. Ive done a pcb that's basicaly a breakout for the pins on the 4017 mostly to get the connections in order to make it easier to troubleshoot when panelmounting so i'll give a writeup omorrow how my stripboard goes and after that i'll se about posting my pcb if thats of interest. yes they can, try and just rehating all the solderjoint with more solder or just flux if you got it. Well, the bad news is, the nifty clear case I had built this in fell and cracked beyond repair (cheap $10 pencil box/makeup box by Vaultz). The good news is, I took it out of the enclosure and spent some time with it and realized I'd skipped a very important connection--pin 13 was not grounded, and in fact was floating. Grounding it appears to have solved the basic problem of random hangs. To re-explain, my attempt to get trigger outs is pretty simple. gate AND clock with a 4081. The problem is, the gate drop is slow enough relative to the clock that I always get a tiny trigger pulse on the trailing edge of the EDIT: gate, not trigger. If I have the gate switched off for two steps, the second step doesn't pass a trigger. But of course that's not how I *want* it to behave. My guess is that I could put an appropriately sized cap to ground on the trigger line and it would filter out that tiny bump without introducing too much slew, but I'm not sure how to figure that. The bump is less than 1ms, and a typical trigger is about 8ms. got a schematic of what you are trying to do? i've implemented this a couple of times in sequencers, it could be something easily rectified. 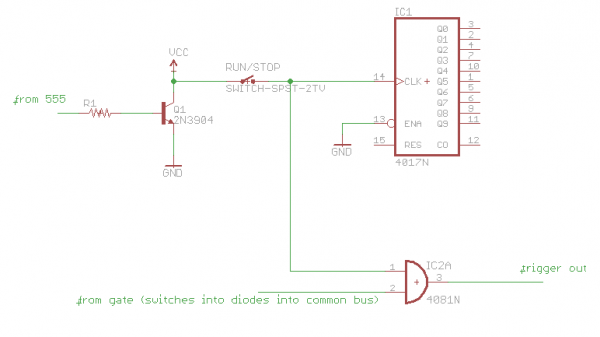 Didn't draw a schematic because it's a single AND gate. clock from the 555 on the original stripboard, and gate from the standard arrangement of 4017 step -> switch -> diode -> common gate bus. Each goes into one side for 4081 and gate and I take the trigger from there. No sure if I fully understand what's going on, but to get a trigger in the past I have inverted the clock signal first to get a narrower pulse to clock the 4017, then AND it with the step output/gate from the 4017. I used a 4011 to do this if I remember. First schem is my current config, second is what I'm proposing, except I'm not sure what values to use. but it does make some sense. Assuming you mean you only invert the CLK for the 4017 and AND the gate out with the un-inverted CLK. Reading back to an earlier post I assume you are trying to obtain a trigger out of sorts. I inverted the clock with a 4011 NAND and I clocked the 4017 with this signal. 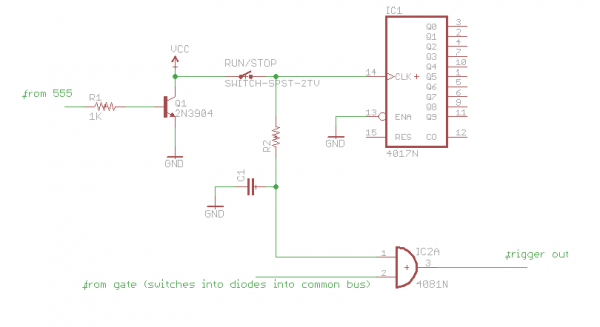 I then used AND from NAND to create short triggers using the clock I had inverted and the step/gate outs of the 4017. 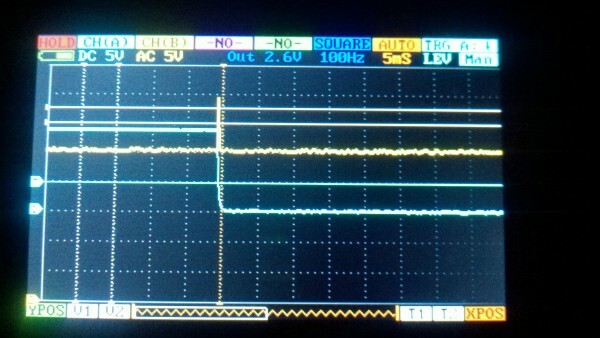 I found that inverting the output from pin 3 of the 555, I obtained a much shorter pulse. 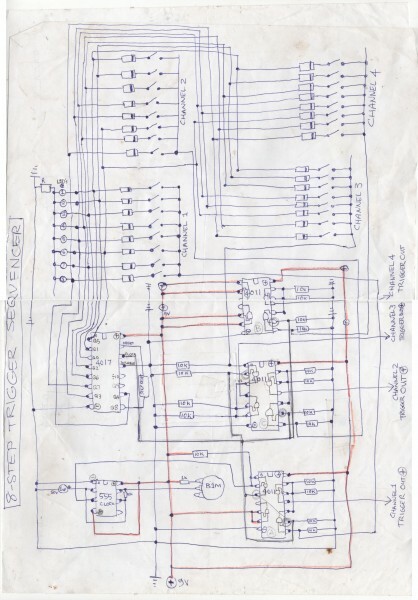 Here's a very old drawing of what I did when I made a trigger sequencer. Yes it's confusing.... ... but it works, even without decoupling caps! The only difference I can see in what you're doing vs what I'm doing is that you're using NAND gates, and I used a transistor inverter and an AND gate. Well I'm equally confused by that . So you are inverting your clock, sending that to the 4017 to clock it, and AND-ing the 4017 output with the inverted clock? Strange it isn't working. That sequencer I made certainly works. I still use it to test things as I haven't yet replaced it. If all my switches are on, it works great, now that I've properly grounded pin 13 of the 4017. What's going wrong is that if I have a switch off, I still get a tiny trigger as the gate is dropping. More switches off in a row, and they all stay off, no triggers. I can see on the scope trace exactly what's going on--It's the clock that causes the 4017 to advance to the next step, and the gate takes some time to drop, so the leading edge of the clock and trailing edge of the gate are both "high" for enough time that the AND gate sends out a high signal. It's under 1ms, but it's enough to trigger at least my soundlab which I've been using to test this. The only thing I can think is that since you're going through 4 gates as opposed to me going through a single gate, somehow the gate delay is just long enough to prevent this, or the 4011 response times are different than the 4081. I have the clock and gate outputs going to jacks, so what I probably ought to do is throw a 4011 on a breadboard and see if it behaves the same when hooked up exactly like your circuit (well, except for the inversion of the clock, undoing the transistor will be harder than changing the rest of the logic). Well perhaps the fact I have run mine from 9V is the difference like you said. I'm not sure the NAND making AND or simply using an AND IC would be different. After I read through your previous posts I saw that you were doing the same thing as me anyway. Yeah, try it a 9V and see what that does. 4011 (two stages anyway, NAND + inversion) doesn't matter. I've attempted to filter on the output side (not like the schem above) with a 1K resistor in series and a cap to ground, trying sizes from 100pF up to 10uF, doesn't matter. Subbed in a 10K, also doesn't matter. Wow this is very strange. Maybe the fact I didn't add the 100nF caps to the IC power pins on mine is making it 'work'? I really don't know what to suggest. I have not experienced double triggering like you have. I should hook mine up and do some tests and look at it on a scope which I have never done. The only thing I have left to think is maybe it's a high enough voltage it takes too long to drop (at 15V or 9V), and if I clamped it to 5V maybe it would behave better. I'm just not getting it though, this is a really simple circuit, and I've gone over Fonik's Baby-10 schematic as well--there's not anything special I've seen any of them do to avoid this problem. I've just looked at Fonik's Baby 10. He is feeding his clock through a CGS Gate to Trigger converter then into his decade counter. He seems to be taking the gate output and sending that through the other Gate to Trigger circuit on the IC. What I don't get is how is he managing to trigger on consecutive steps from this. You'd need a gap of some sort between steps which the 4017 doesn't have. But look, maybe there is a possible solution in this. What about sending the clock from the 555 through a Ken Stone Gate to Trigger Converter then into the 4017? Would that clean up the clock or is this more to do with the gate from the 4017 taking a while to drop off? Actually, what about what PHOboS was saying earlier... If you clocked the 4017 with a non-inverted signal from the 555, then AND an inverted clock with the 4017 gate signals to obtain a trigger. Surely there would be a sufficient delay to eliminate this problem? ... although I think I'm suggesting the opposite of what PHOboS is saying . I've got to get out the sequencer I made and see if I have this problem but somehow never noticed! The clock seems plenty clean. Ok, drew it out on graph paper. #1, that moves the trigger to the trailing edge of the gate rather than the leading edge. #2, it looks to me like I'd have the same problem at the leading edge instead. Fonik, I have built your version of the Baby10 and made some adaptations including this one. Unfortunately this wasn't as simple as you described it. You will have to take the propagation delay of the 4017 into account. If you don't do, the gate signal will occur later then the clock signal and will, due to lasting too long, also send out a trigger signal on the next step. To counter this you can chain some AND gates to add some delay to the clock signal. So when I tried this with the 4011, I inverted the output of the NAND, but still did the NAND at the first step. This sounds like I need to invert the clock twice and then NAND and invert again, or I need to run the clock through some of my AND gates (on the 4081) before ANDing with the gate. Which sounds like maybe I could run the gate into several of the AND gates, then put the clock into the first, the output of that set into the second, and so forth and maybe that would trim this bump as well. Let me try these two approaches and see. Neither one of those approaches helped. I also tried using the gate delay of a 40106 hex schmitt inverter, and had 4 inverters in line with the clock side and that didn't help either. So I turned to the idea that I need to debounce the output of the AND. Using a fairly standard approach, 330K to .1uF cap, I get no trigger through at all. If I drop the resistor down to 100K or 120K it gives me double triggers. 150K gets no trigger. Putting resistors in series I narrowed it down to 130K still giving me a double trigger, but 135K none at all. I tried 131K and then weirdness ensued: the trailing trigger got through, but the main trigger did not. I will have to hook this up to a scope later to see what the heck that's about. OK, so you tried clocking the 4017 with a NON inverted pulse from the 555, and then using an INVERTED 555 clock ANDed that with the 4017? There must be a solution to this. Either sorting out the gate issue, or delaying the clock somehow. What about flip flopping the clock? so you send the clock to a 4013 and take the one Q output to the 4017 to advance the steps, and the other Q (Q with a little bar over it ) you use to AND with the step. Would that give you a trigger point in the middle of the step? Might be too large a delay actually. Particularly if the clock is slow. Yeah, I don't know. It's tricky isn't it? I'm thinking that with the sequencer I made, I haven't noticed this behaviour because I have only ever triggered those 808 modules with it which might not be as picky as the Soundlab. What about sending the 555 pulse (inverted or non inverted) to a 4013 input. The Q out will be dividing the clock from the 555 by 2. Then take to Q out from the 4013 to the 4017. So it takes two clock pulses from the 555 to get the 4017 to advance a step. The 4017 has your trigger switches at each step. So you AND the steps with the 4013. This gives a gate half the length of the 4017 gate/step length. Then you AND the output of this with the original 555 clock pulse to give the trigger. I'm thinking this will eliminate the lagging 4017 gate at each step because you can shortened it by half. Do you thing this would work? EDIT: Actually I don't think this will work because there would still be that lag from the 4017! It's about time someone makes a decade counter with a trigger out. This logic does my head in! That'll be next, but we'll see when I get to it. I didn't do the non-inverted version because it just inverts the problem Gives me spurious leading edge triggers, and it also makes the step trigger occur at the end of the cycle which would put it at the end of the gate for anything where I was doing alternating switches. I'd try the Ken Stone Gate to Trigger circuit. They are excellent and very easy to build. I was so impressed I made six of them! This seems to be what Fonik is using. I have PM'd Fonik out of desperation! Maybe he will have some advice. Yeah, the Ken Stone Circuit, as shown in the Baby 10 schematic, is what I had in mind. I did figure out what was up with my first step: it was cranked all the way up so it was a frequency past my hearing.